Proud to be born on the eve of the Assyrian New Year (April 1, 1948), in the ancient Assyrian town of Alkosh - Nineveh Province, and baptized in its historical monastery “Raban Hurmis” known as “Derah A’alayah”, the Upper Monastery. Raised in the city of Kirkuk, north of Iraq. Completed elementary, intermediate and high school education in Kirkuk, and in 1968 moved to Baghdad. Married and has a daughter and a son. In 1971, he left the College of Arts to enroll in the College of Law and Political Science at Al - Mustansiriyah University in Baghdad. Attended evening classes and financed his education with a daytime job. In 1975, he graduated with high honors, receiving a BA in Political Science, ranking first in his college. In 1976, by reasons of his outstanding achievement at the BA degree level, was admitted in the College of Law and Political Science at Baghdad University for higher education (Master degree program) and on full time basis. classes, political parties, revolutions and their role in social changes. Refusing to become member of the Iraqi Ba’ath Party, which was the main condition of appointment as teacher in a collage, also refused to comply with the fascist policy of the Iraqi regime and to threats from security and Party apparatus, as a result, Aprim was thwarted in his hope for an academic career. He was deprived of any academic position, even though this ran counter to the High Education Law, which guaranteed appointment of anyone graduating with high honors to the position of Lecturer Teacher in the same university. 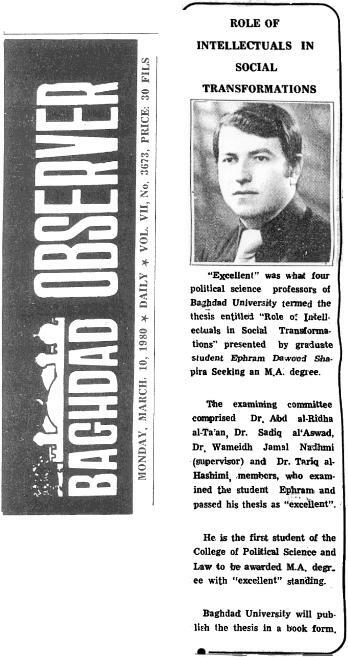 While he met all academic requirements to pursue advanced studies, i.e., the Ph.D. program, his applications for Doctoral candidacy were consistently denied, in addition, he not permitted to leave Iraq to pursue his studies at his own expense. Such tyrannical policy was always explained to him very simply: “You are not Ba’athi”. Due to heavy- handed Iraqi policies and in order to earn a living, he was forced to work with a foreign company in a field outside his academic background. In 1981 he was employed as Administrator by a British/International major company involved in civil construction, and he would be then rise to the position of Iraq Branch Manger. In early 1992, he and his immediate family departed Iraq for London. He continues to be employed with the same company, where he is now Marketing Manager. Professional affiliations include The British Chartered Institute of Marketing and the EC Institute of Marketing. “Racist Instigator” in order to intimidate him from writing on Assyrian questions and to suppress him from his well-known position in the Assyrian Cultural Club (Shautaputah), particularly during Black July 1984, when 21 members and supporters of the Assyrian Democratic Movement were arrested. The Ba’ath regime in Iraq succeeded in thwarting his academic dream but failed to dampen his national beliefs and his determination. He has withstood relentless pressure and has persisted in his writings, most of which appear in the “Assyrian Intellectual - Mordinah Atoraya” of Shotapotah. He was a member of the Assyrian Cultural Club, from its inception until its closure; he was also a member of its executive committee and vice chairman. He participated in editing and managing the above mentioned publication. 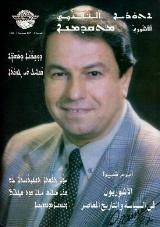 Aprim was also an Executive member of the “Syriac” Writers Federation and editorial member of its Magazine “Khuyadah”. His other affiliations have included; the Iraqi Writers Federation; the Iraqi Juristic Association; the Political Sciences Society; and the Human Right Organization - Iraq. In London, where the democratic environments fueled his determination, he pursued his writings and nationalistic activities with added zeal. He joined Assyrian Club of the UK in London, and participated in most of its cultural activities including its publication, The Assyrian. November 1998 (When he discussed the Assyrian National Movement and the participation of Assyrian Parties in the Iraqi oppositions). Aprim maintains good relations with Assyrian political parties and national organizations, and in particular, with those who are active in the Homeland. For that reason he paid several visits to Syria and North of Iraq, and while there he has attended meetings, delivered lectures, visited Assyrian Schools and participated in national events. In the UK, he is member of the Amnesty International-UK section and a longtime correspondent with the U.N. Commission for Human Rights in Geneva. He maintains contacts with Minority Rights Group in London and other international and academic organizations concerned with human & minorities rights. The Assyrian Cultural Club 1970 - 1980: A March of Challenges & Achievements (1993). The Assyrians in Politics and Contemporary History: A Collection of Essays & Treaties (1997). Politics Phobia in the Assyrian Society: A Socio-political Study on the Assyrian National Behavior (1998). Speculative Terminals on the Assyrian National Performance: A Comparative Review between Homeland and Diaspora (August -2000). Naoum Faik: Teacher of the National Unity Thought. To be distributed in early February 2001 during his anniversary ceremony. The Assyrians in the Iraqi Thought: A Case Study on the Iraqi Mentality on Minorities. Separation Between Politics and Church in the Assyrian Society.